According to the reputed media outlet Sport, Spanish giants FC Barcelona have won the battle against Paris Saint-Germain and Manchester City to secure the services of Ajax's Frenkie De Jong. According to the report, the 21-year-old is set to become one of the highest earners at the club and won't come for cheap, thanks to the massive interest from other big-weight teams. De Jong, the Dutch midfielder, has already generated huge interests across all Europe due to his majestic displays. And it is no secret that besides Barcelona, giants like Paris Saint- Germain, and Manchester City were linked to sign the prodigy. It is rare for a player of his age to show immaculate control and maturity on the ball, but De Jong is already touted to be the next big thing in Europe. Moreover, his style of play is similar to that of the Catalan giants and he is already a massive favorite in the Nou Camp. Frenkie De Jong is a product of the famed Ajax Academy, which is one of the finest in the world. Some of the world's greatest players of their generation like — Cruyff, Seedorf, Kluivert, Bergkamp, De Boer, and more recently the Tottenham duo of Eriksen and Alderweireld were the fruits of Ajax. It seems quite clear that Paris Saint-Germain, Manchester City, and FC Barcelona were at war over the signing of Dutch midfielder. 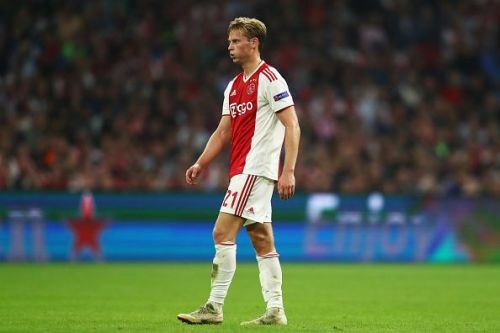 Previously, De Jong had committed to stay at his club at least until the season finishes, but now multiple reports suggest that he will be heading to Barcelona. According to the report, Ajax is set to demand a fee in the region of €75 million for his services. Barcelona will be able to pay in three installments (other clubs offered Ajax the possibility of paying cash in a single installment), a move that will make the transfer even more expensive. With multiple sources reporting that Barcelona has at last won the transfer saga to secure the services of Frenkie De Jong, the shift now looks more possible than ever, since the young midfielder was bound to leave Ajax sooner or later. Both City and PSG are under investigation from FIFA due to a reported breach in the Financial Fair Play (FFP) rules and regulation which might pave the way for De Jong to Nou Camp. His arrival will be an obvious boost to Barcelona as they look to add quite a bit of silverware this season.